This is David Remnick’s memo to New Yorker staffers about the decision not to interview Steve Bannon at the magazine’s yearly festival. Remnick is the magazine’s editor who intended to interview former Breitbart Media chairman, former Trump aide and former chief White House strategist Bannon before a live audience at a festival of ideas. Remnick had “every intention of asking him difficult questions and engaging in a serious and even combative conversation”. Even if thrice-divorced Bannon is yesterday’s man, it sounds great. I’d never heard of the Festival before now but count me in. But other notable guests – Jim Carrey, John Mulaney, Patton Oswalt and Judd Apatow – said they’d withdraw unless Bannon was given the elbow. The New Yorker’s Kathryn Schulz tweeted: “I love working for [the New Yorker] but I’m beyond appalled by this … I have already made that very clear to David Remnick. You can, too.” She provided a New Yorker email address. To which Remnick said: screw you. Sunlight is the best disinfectant. Let’s expose the enemy with our wit and democratic values. It’s a Festival of Ideas not a bloody dinner party. And in any case, it’s rude to invite someone and tell them they’re not wanted. Nah. He kiboshed the whole thing. The effort to interview Bannon at length began many months ago. I originally reached out to him to do a lengthy interview with “The New Yorker Radio Hour.” He knew that our politics could not be more at odds — he reads The New Yorker — but he said he would do it when he had a chance. It was only later that the idea arose of doing that interview in front of an audience. Some on social media have said that there is no point in talking to Bannon because he is no longer in the White House. 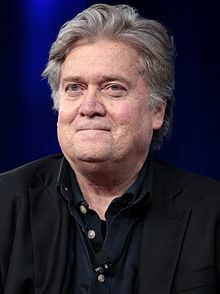 But Bannon has already exerted enormous impact on Trump; his rhetoric, ideas, and tactics are evident in much of what this President does and says and intends. We heard Bannon in the inaugural address, which announced this Presidency’s divisiveness, in the Muslim ban, and in Trump’s reaction to Charlottesville.What’s more, Bannon has not retired. His attempt to get Roy Moore elected in Alabama failed but he has gone on to help further the trend of illiberal, nationalist movements around the country and abroad. There are many ways for a publication like ours to do its job: investigative reporting; pointed, well-argued opinion pieces; Profiles; reporting from all over the country and around the world; radio and video interviews; even live interviews. At the same time, many of our readers, including some colleagues, have said that the Festival is different, a different kind of forum. It’s also true that we pay an honorarium, that we pay for travel and lodging. (Which does not happen, of course, when we interview someone for an article or for the radio.) I don’t want well-meaning readers and staff members to think that I’ve ignored their concerns. I’ve thought this through and talked to colleagues — and I’ve re-considered. I’ve changed my mind. There is a better way to do this. Our writers have interviewed Steve Bannon for The New Yorker before, and if the opportunity presents itself I’ll interview him in a more traditionally journalistic setting as we first discussed, and not on stage. Bannon should write Remnick a thank you note for making him ‘great’ again.